“The Class”Click here to share or send a greeting with this image. Touring Egypt 18: New divers arriving at Sharm el-Sheikh always have at least one “check-out” dive before joining the longer boat trips to the famous dive sites of the Red Sea. One of the places favored by the divemasters at the Camel Dive Club and Hotel is less than 10 minutes’ boat ride, just around the point from the dock in Na’ama Bay. The Camel divemasters call it “Tiddle Gardens.” You won’t find this site on a map; it was invented by one of Camel’s divemasters. On a map, it is found mid-way between the two more well-known sites, “Near Garden” and “Far Garden.” This is a very gentle dive over varied reef, with little or no current and excellent visibility. An easy, relaxing dive for the beginning of a holiday. My eye was drawn by a shimmering mass. I could see the distinctive shape of a coral head not far away, but it was obscured by a shifting, shimmering veil moving constantly around it. I moved easily that direction and soon an orbiting curtain of small silvery fish came into focus, staying close around the coral head and avoiding the larger fish cruising the open reefs all around. 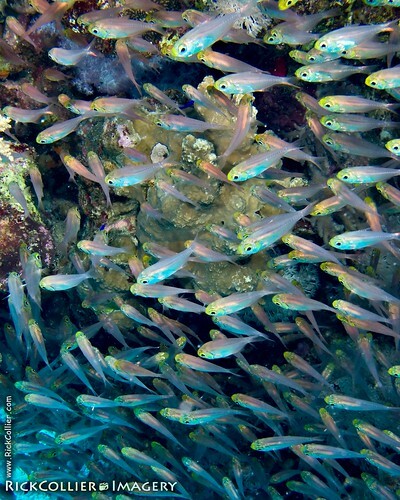 Divers here call the small fish variously “sweepers” or “glass fish.” They shimmered and reflected a rainbow of colors, casting ever-changing shapes across the coral head. The show was dazzling; I could have watched it all day. As I drew closer, the school made space around me while staying close to the coral. My shadow temporarily fell across a group of fish near the coral, blocking the surface light and allowing me to see their beautiful, nearly transparent pastel pink and peach colors. The sweeper school shifted constantly and closed behind me as I moved easily around the coral head, revealing small pipefish, lionfish, and others moving gently among the nooks and crannies hidden by the crowd above. “Rainbow School”Click here to share or send a greeting with this image. This entry was posted on Wednesday, September 16th, 2009 at 18:17 PM. 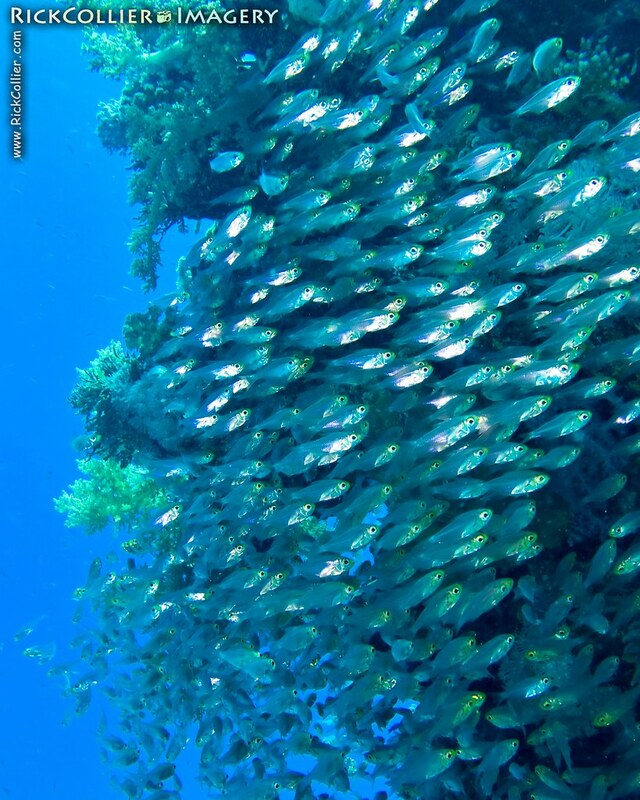 It is filed under thePhotoTourist, Underwater and tagged with coral, coral reef, Egypt, fish, glass fish, glassfish, Red Sea, scuba, scuba dive, scuba diving, Sharm, Sharm al-Shaykh, Sharm el-Sheikh, sweeper, sweeper fish, sweepers, Underwater. You can follow any responses to this entry through the RSS 2.0 feed.